Glenview Grows is Glenview Elementary’s garden committee, made up of parents and students who plant and maintain the gardens on the Glenview school property. WE DID IT! At our Garden Work Day on April 6, 2019, more than 20 parent and kid volunteers weeded, moved more than 1,800 pounds of soil, created a 7’ tall archway to grow runner beans, and laid out and planted a mounded herb and veggie pinwheel, and much more! 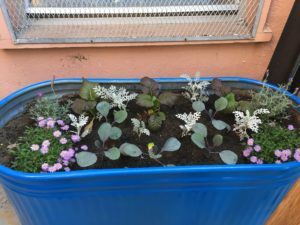 Why Are School Gardens Important? From learning where food comes from and how plant and insect life cycles work to enjoying the beauty of quiet spaces, a school garden can be a big benefit to children and teachers alike. 1 in 3 children born in the year 2000 are on track to develop Type II diabetes (and that’s 1 in 2 if they are a child of color). These statistics are sobering, but the good news is that our school garden will help our students learn about how to grow their own food, how the food cycle works, and that caring for nature can be delicious and fun! We are working hard to get everything in place to help the kids explore and for the teachers to use the garden. Statistics also show that children who grow their own food are more likely to eat fruits and vegetables and to be more knowledgeable about nutrition. They are also more likely to continue healthy eating habits throughout their lives. School garden programs have other impacts as well. They have been shown to improve children’s behavior and performance at school and improve their attitudes about, and appreciation for, the environment. Gardens serve as great outdoor classrooms for any number of subjects, including science and ecology, math, creative writing, and art. School gardens are wonderful spaces for kids with different learning styles and abilities to work in groups and engage in hands-on, cross-disciplinary education. We need a lot of parent involvement to make all of these wonderful things happen. There are lots of opportunities for small time or materials contributions that can make a big difference. Parent volunteers at our Garden Work Day recently created an herb pinwheel garden to showcase the beautiful sights and smells of a garden bed, and a 7′ high green bean tunnel that should provide a shady green space for a snack or a rest once the beans have covered the archway, and a number of smaller planters for teachers to use. We will spend time in the spring and summer of 2019 planning and designing, and then when school starts in August, we will do more building and growing! We have a large list of needed items from small (seeds) to very large (lumber), so if you have resources to donate or know of a business that can donate items or work time, please get in touch. Please get in touch if you have a few hours to spare on a weekend or are looking for a regular monthly commitment. 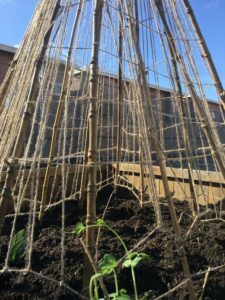 We also would love help with curriculum coordination (getting teachers to use the garden for lessons), which can be done at home; ideas for new programming (want to create a cultural planter with vegetables and herbs from your part of the world? create a sensory garden that is fun to touch and smell? ); and soliciting donations (from seed packets to garden journals to garden artwork). If you are interested, please contact Elizabeth Adam at glenviewgrows@gmail.com, or sign up for the Garden Committee on Konstella. If you have of the following items to donate, or have questions, please contact Elizabeth at glenviewgrows@gmail.com or 510-967-1214. In February 2019, Glenview Elementary was awarded a $2,000 grant from the WholeKids Foundation (a part of Whole Foods) to create an edible schoolyard at the Santa Fe site! Their support means that we can really get our garden off to a great start with good soil, plants, tools, and curriculum support. A huge thank-you to them! A big thank-you goes out to Grand Lake Ace Hardware’s Garden Center for helping us with vegetables, herbs, flowers and a new hose to get our garden growing strong!